Technically, things are looking pretty crappy. Or at least the set up is making the big-boys think twice. We have a set up where all the major daily shorter-term SMA support has been breached. 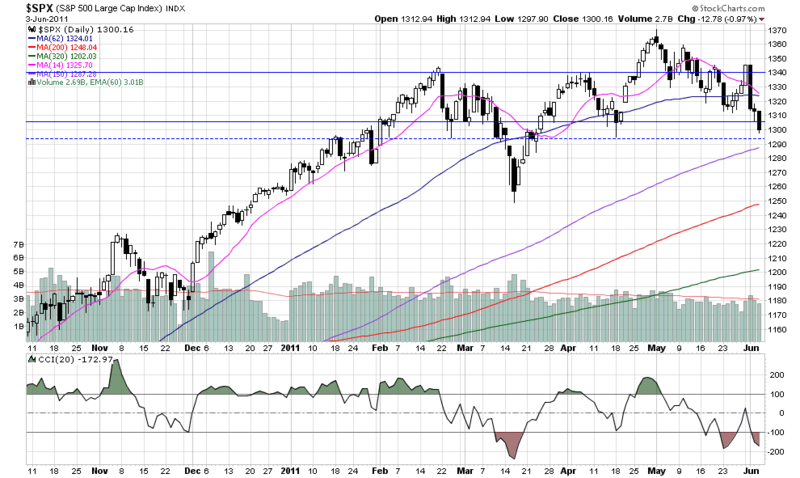 However, the SP500 is oversold on technical support, and now approaching the loner-term 150 SMA support. It is also on the weekly 28SMA support. IMO, some pretty strong support. However, looking at these charts, it is obvious that the next leg of support is a ways down. 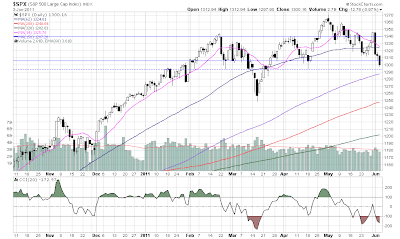 The daily indicates the near the 200SMA and 1250, which looks to be very strong support. The weekly indicating the low 1200s. If these supports can not hold, the ultimate support for the current long-term trading dynamic of this rally is at the daily 360SMA. If we see an eps of $96 by year's end, a trailing PE of 14-15 would lead to an SP500 range of 1344 to 1444. Similarly, if 2012 is to see an eps of $104, a trailing PE of 14-15 would lead to an SP500 price range of 1456 to 1560. An SP500 that hovers around 1290 for the year is basically projecting flat eps growth. However, we already have confirmation that despite weak economic data, this is not the case. So the market 'should' bounce to reflect price action of normalized multiples. 'Should' represents a sane market psychology, and we know the market is far from sane. If the market declines to the 1250 level, this would represent a consensus of reduced eps. We already know that this is not the case, and if the market does approach these levels, it is a very good buying opportunity. IMO, the only way the SP500 goes below 1250 (and I hesitate to think we even get to 1250 but with a market that allows a company like Apple to trade with an ex-cash multiple of less than 13, I would not be surprised), is if a systemic threat to the system occurs. However, with proper EU reform taking place, that is one major uncertainty removed as a systemic threat.